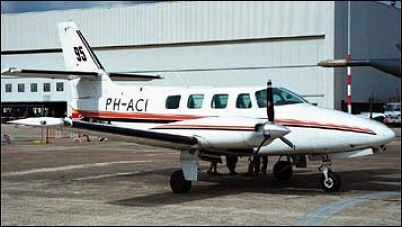 On 14 February 1978 Cessna flew the prototype (N303PD) of a new lightweight twin-engined aircraft which it then designated Cessna Model 303 Clipper. In this prototype form it was a four-seat aircraft of low-wing monoplane configuration with the wing incorporating a super-critical aerofoil section. Other features included retractable tricycle landing gear, swept vertical tail surfaces with a long dorsal fin, extensive use of bonded construction and power-plant comprising two 119kW engines. Before the certification programme began it was superseded by a new Model T303 which reverted to conventional construction, had six-seat accommodation, was powered by two turbocharged engines of increased output, and had acquired the new name Crusader because the earlier title of Clipper infringed a US trademark. Cessna claimed the Crusader was the first lightweight twin of its class to have full IFR avionics and equipment as standard, and that handling of the aircraft benefited from the high set tailplane, coupled with unusually, counter rotating engines, which minimise engine torque effect. Production model Crusaders were certificated in August 1981, and first deliveries followed in October. When production ceased in 1986 297 had been delivered. Great aircraft with good short TO and LDG capabilities and low empty weights. A little weak brakes, however sturdy gear. Dependable engines, only their starter drives are a mess. A real pleasure to fly. Owned N6498V since Jan 1990. Absolutely fabulous aeroplane!